Enjoy greater security and convenience when you use smart switches and dimmers to control home lighting with your wireless phone. 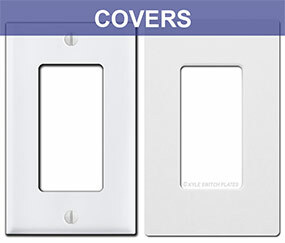 Find top rated Lutron Caseta smart light switches, outlets and dimmers that make home automation easy. 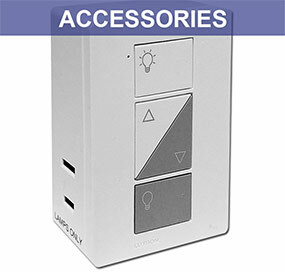 Lutron's Caseta line offers a variety of control options for your lighting and motorized shades. Replace a standard switch with a dimmer for dimming capabilities. Add a Pico remote for wireless control. Install a Smart Bridge hub to incorporate control from your smart phone or voice control through Amazon Alexa or another voice assistant. You can get all these items in our starter bundle here. You'll love the high-end look of Lutron's elite line of lighting controls. 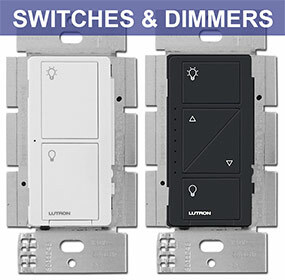 Replace an old dimmer or just a standard light switch with one of Lutron's Caseta switches or smart dimmers. Use the separate buttons on the Caseta devices to control your lighting. Caseta light dimmers and modern switches fit rocker openings (the large rectangle one shown here). Your options for covers include standard rocker plates (with screws, available here in 17 finishes) or screwless covers with rocker openings. One of the benefits of installing Caseta devices is the ease of control when paired with a Pico remote. Turn lights on or off from your garage, the couch or even your bed. The dimming remote allows you to brighten or dim the lights from your couch, bed or dining room table (compatible dimmer switch required). Remotes can be handheld, mounted on a wall (wall kit sold separately), or stored in your car (visor clip sold separately). Get a Smart Bridge hub and your flexibility in lighting control widens even more. 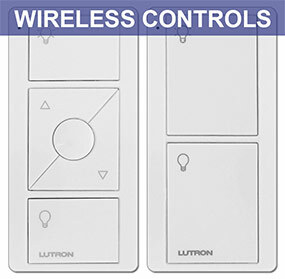 Control Caseta dimmers & switches using iOS or Android devices with Lutron's free app. The hub allows for voice control of your lights if you have Amazon Alexa or Echo, Apple HomeKit or Google Assistant. Also controls motorized Serena shades, Nest and Sonos. Want to wirelessly control or dim a plug-in lamp? This plug-in dimmer fits right into your existing receptacles. Plug in 1 or 2 lamps and use the buttons on the device to adjust dimmable bulbs. Can also be paired with a Pico remote for wireless control (buy the dimmer and remote together here) or to a Smart Bridge for mobile or tablet control. Lutron offers reliability that other brands cannot. In business for over 50 years, Lutron is dedicated to providing quality lighting control that's easy to install and simple to use. Manage your lights with dimmers, remotes, the mobile app or through voice assistants. 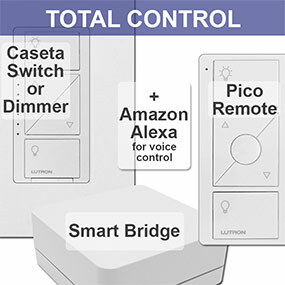 Get a Caséta Smart Bridge and connect with more leading smart home devices than any other smart home lighting control brand. Manage the lights plus cameras, temperature, shades and even your music. Works with voice assistants to complete and total control. set scenes of preferred lighting such as "dinner time" or "movie night"
Get started with a Smart Lighting Starter Kit, which includes a dimmer switch & cover, remote control and hub. The starter kit will allow you to dim the lights at the wall and wirelessly with the included Pico remote or your smart mobile phone. The Pico remote can also be installed in the wall (with a separate bracket and cover plate) to act as the 2nd switch in a 3-way lighting configuration. The Smart Bridge hub in this kit expands your options for control. You can add a voice assistant or pair with your smart phone to control with Lutron's free app. For added control, purchase additional switches, dimmers and remotes to several locations throughout your home. Q: What do I need to operate a Caseta switch? Dim a lamp: Add a plug-in lamp dimmer to an outlet. Dim lights from wall only: Simply choose a wall dimmer such as the X for X bulbs or X for X bulbs. Dim lights from wall + remote control: Install a wall dimmer and purchase a separate Pico remote. Control lights from mobile device: Purchase the wall dimmer and Smart Bridge hub; download free Lutron app for IOS or Android. Q: Can I control the lights from my phone? A: Yes, using Lutron's free app for IOS & Android. The app communicates with the Smart Bridge hub (also required) to control lighting from your fingertips. Q: What is the Smart Bridge? A: The Smart Bridge is Lutron's hub. It is required to adjust lighting from a voice assistant or with the app on a mobile device. It isn't required to control lights at the switch or with a Pico remote control. Q: Do I need a Smart Bridge to control the lights? A: If you want to control the lighting from the app or a voice assistant, the Smart Bridge is required. Q: What is the difference between the Smart Bridge and Smart Bridge Pro? A: The Smart Bridge Pro offers integration with select A/V and security systems & gives support of additional window shades beyond Serena shades. The Pro hub supports Sivoia QS, Triathlon & select Sivoia QS wireless shades. Q: How many Caseta switches can I install in my home? A: Smart Bridge supports up to 50 wireless devices. Smart Bridge counts as one device, as does each wireless dimmer, switch, Pico remote, plug in dimmer & set of wireless shades. Q: Will the Smart Bridge slow down my other Wi-Fi connected devices? A: No, the Clear Connect® Technology doesn't interfere or compete with your other Wi-Fi connected devices. Q: Will these switches work with my Alexa (or other Smart Home Assistant)? A: Absolutely! 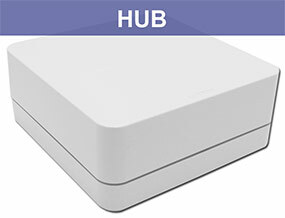 You'll need to purchase Lutron's hub - the Smart Bridge. Q: What type of bulbs are these dimmers compatible with? PD-6WCL (Wall Dimmer Switch): Works with up to 150 W dimmable LED/CFL OR 600 W incandescent/ halogen bulbs. PD-5NE (Wall Dimmer Switch): Works with dimmable LEDs, ELV, MLV, incandescent and halogen bulbs. PD-3PCL-WH (Lamp Dimmer) : Works with 100 W dimmable LED/CFL or 300 W incandescent/ halogen bulbs. PD-6ANS (Wall Switch + Fan Control): All bulb types; turns lights or ceilings/exhaust fans on and off. Q: Do I need a Pico remote? A: No, but it will give you added control from anywhere in your home. Additionally, a pico remote can be mounted in place of a switch, to give you 3-way dimming functionality from two locations. Q: How do I dim from both locations in a 3-way set-up? A: Install one smart dimmer switch in 1 of the 2 locations of your 3-way setup. Install a wall-mounted wireless remote in place of a 2nd dimming switch at the second location. This requires your choice of remote, a mounting bracket, and a wall plate. The remote will fill in where you previously had a 2nd switch. Q: What is the difference between the different Pico remotes? Q: Can one remote be paired with several lights or do I need a remote for each light I want to control? A: All remotes can be paired with multiple lights. Q: Can multiple remotes be used to control a single switch? A: Yes. More than 1 remote can be used to operate a single smart switch. Q: Why are my dimmable LED lights flickering when dimmed? A: The range of power that will be put out by the Caseta dimmer needs to be adjusted (trimmed) since LED bulbs are very low power compared to a 60W incandescent bulb. Trim by making sure the bulbs are on & hold down both the "On" and "Lower" buttons on the switch for 6 seconds, until the indicator LED flashes. Then, use the "Raise" & "Lower" buttons to adjust the dimness of the bulbs until the flicker is gone. Once you're happy, holding down the "Off" button on the switch for 6 seconds will save the adjusted setting. Q: My house is older and my switches only have 1 wire running to them (no ground or neutral wires). Can I still install Caseta switches? A: Yes! Caséta is the ultimate in compatibility & the PD-6WCL dimmer switch (for incandescent/ halogen bulbs) does not require a neutral wire. This allows installation in older homes up to 2,500 square feet in size. Be sure to read the feature section for each product to see if a neutral wire is required. Q: What else can I control (in addition to the lights)?